In September, I visited the Diois (pronounced Dee-wah) for a harvest festival for Clairette de Die (pronounced Dee), which ended up being cancelled part-way through due to the torrential rain. I partly went there to see whether there was enough to write about for a mini-micro-region guide for Wine Travel Guides or should that be a mini-region guide? I ended up unsure, but wrote about my visit anyway for Wine Pages. Not really belonging in any major wine region, it’s one of a myriad of tiny, remote wine regions in France with spectacular scenery. Produced near the town of Die in the mountains east of the Rhône Valley, Clairette de Die is a semi-sweet sparkling wine and about 90% is made by the very switched-on cooperative cellar Jaillance. Jaillance not only provides an excellent tour and tasting, but has over 10% of its members working using organic methods – most commendable. The star of the individual producers in the region is Achard-Vincent who are in the process of converting to biodynamic methods having been organic since the 1970s (when it was de rigeur for all organic growers to wear sandals – this family still does, by the way). They produce a range of delicate Muscat-based Clairette de Die that is just delicious. The festival was lovely, but there is a real dearth of good places to stay in the area. The little town of Die boasts a couple of decent restaurants – the wonderfully wacky organic restaurant Tchai Walla and a more traditional, but very good restaurant, the Vieux Sonneur – neither have websites. Other obscure regions that could one day be included on Wine Travel Guides include Bugey, next to Savoie; various little regions on the foothills of the Massif Central near the source of the Loire River including St-Pourcain and Côtes de Forez; Vins de Moselle near Metz up towards Luxembourg and several others. In the meantime, at least we do include micro-region guides to Gascony, the Jura and part of Savoie, all of which are pretty obscure, but great fun to visit. 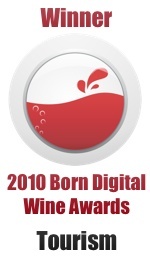 This entry was posted on Wednesday, December 17th, 2008 at 5:05 pm and is filed under Vineyard Visits. You can follow any responses to this entry through the RSS 2.0 feed. Both comments and pings are currently closed.